Most telephoto zoom lenses designed specifically for APS-C rather than full-frame DSLRs have a zoom range of about 50-200mm. 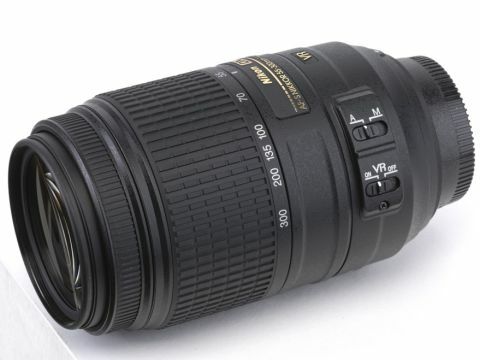 This gives them an effective zoom range of 75-300mm on Nikon camera bodies such as the D3100 and D5100, very close to the classic telephoto zoom range of 70-300mm on full-frame cameras. However, many photographers fit full-frame telephoto zooms to APS-C cameras, even though they're usually bigger and heavier, because this boosts the effective telephoto reach to 450mm. Launched in September 2010, the Nikon Nikkor AF-S DX 55-300mm f/4.5-5.6G ED VR aims to give you the best of both worlds, combining a compact and lightweight design optimised for APS-C cameras with extra telephoto reach. Under the skin, the Nikon 55-300mm VR is based on 17 elements in 11 groups, including two ED (Extra-low Dispersion) elements and one HRI (High Refractive Index) element to boost image quality. An aperture range of f/4.5-5.6 to f/22-29 is enabled by a nine-blade diaphragm that has two more blades than the cheaper and smaller Nikon 55-200mm VR lens. The result is a smoother bokeh, or quality of defocused elements in an image. Another major difference between the two lenses is that the 55-300mm boasts Nikon's newer VR II Vibration Reduction system, which gives 4-stop rather than 3-stop protection against camera-shake. The AF-S (Silent Wave) autofocus actuator uses a small ultrasonic motor that's fairly quiet but not as fast or near-silent as Nikon's more advanced ring-type AF-S, and lacks full-time manual override in Single AF mode. For ring-type AF-S autofocus in a Nikon telephoto zoom, you need to trade up to the full-frame 70-300mm VR lens. With its minimum focus distance of 140cm, the lens gives a maximum magnification factor of 0.22x at its longest telephoto setting, which is about average in this class of lens. The filter thread is 58mm and the lens comes complete with hood and soft pouch.